My dear departed friend Stuart Schaeffer did two outstanding things for me, musically: he introduced me to the music of Big Daddy, and he introduced me to the Austin Lounge Lizards. The Lizards are a satirical bluegrass band out of Texas, and their music is just great. Although described as “bluegrass”, they run the range from acapella choral singing to rock and roll, from the aforementioned bluegrass to country, and pretty much everything in between. Their lyrics skewer people and topics, and are cleverly written. Whenever we learn they are coming to town, we do our best to see them (but, alas, they often conflict with prescheduled theatre). Luckily, although there was a conflict, it was with a subscription show, and we were able to change our tickets to Sunday. So last night we got together with some friends and went down to Boulevard Music in Culver City to see the current incarnation of the Lizards do their show. 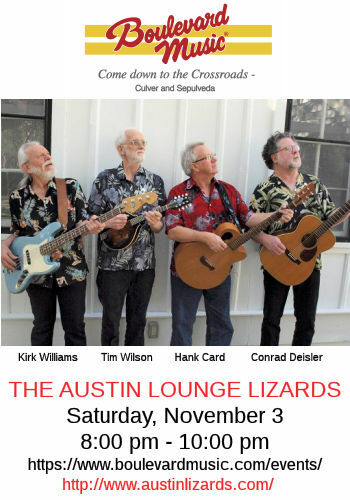 The Lizards are down to two of the three founding members (Tom Pittmann having retired, but Hank Card and Conrad Diesler are still there), and have been joined by two original Lizards, Kirk WIlliams and Tim Wilson. For two songs, Corey Simone, who was also a former Lizard and now has a band in the area, joined the group. I still think they need to combine “Stupid Texas Song” with “I’m Leaving Texas” from Best Little Whorehouse Goes Public. Alas, they didn’t do a number of my favorites, but that’s the nature of any show. What’d I miss? Saguaro, The Drugs I Need, Rasputin’s HMO, Go Ahead and Die (a great medley trio there), Industrial Strength Tranquilizers, Bust the High School Students, Big Rio Grande River, Half a Man, and Big Tex’s Girl… for a start. But still, it was a great show, and you can never get all the songs you want. Today brings She Loves Me at Actors Co-op (FB) a visit to Stitches So Cal. The second weekend of November is very busy: Dear Even Hansen at the Ahmanson Theatre (FB) and A Bronx Tale at the Hollywood Pantages (FB), as well as A Day Out With Thomas at Orange Empire Railway Museum (OERM) (FB). The third weekend of November brings Beyond Jacobs Ladder from Jewish Woman’s Theatre (FB) at our synagogue on Saturday, and Finks at Rogue Machine Theatre (FB) on Sunday. Thanksgiving weekend has Steambath at the Odyssey Theatre Ensemble (FB) on Saturday and Remembering Boyle Heights at Casa 0101 (FB) in Boyle Heights on Sunday. 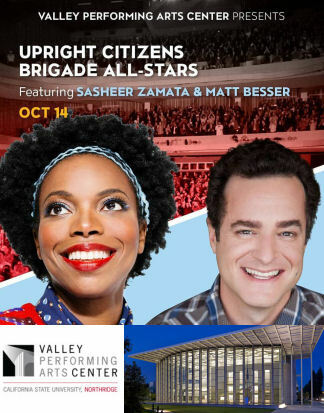 December starts with the Annual Computer Security Applications Conference (ACSAC), followed by a hold for the Canadian Brass at the Saroya [the venue formerly known as the Valley Performing Arts Center (VPAC)] (FB). Then we may travel up to the Bay Area for Tuck Everlasting at TheatreWorks Silicon Valley (FB) (although that is starting to look less likely). January is much more open, especially after the postponement of Bat Out of Hell at the Ahmanson Theatre (FB). 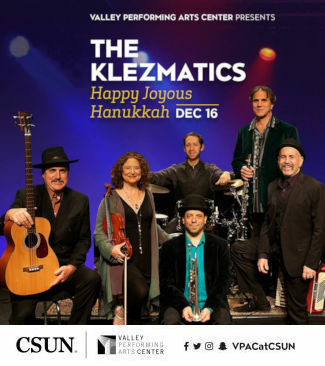 Right now, all there is is a Nefesh Mountain concert at Temple Judea and a hold for the Colburn Orchestra at the Saroya [nee the Valley Performing Arts Center (VPAC)] (FB) but the rest of the month is currently open (as few shows run in January due to complicated rehearsals over the holidays). We’ll keep our eyes open. February starts with the Cantor’s Concert at Temple Ahavat Shalom (FB), Hello Dolly at the Hollywood Pantages (FB), and Anna Karenena at Actors Co-op (FB). There’s also a HOLD for 1776 at the Saroya [nee the Valley Performing Arts Center (VPAC)] (FB), and Lizzie at the Chance Theatre, but much of February is also open. January tends to be a quiet month for live theatre. New shows in small theatres are rare, as they don’t like to rehearse and produce during the holiday season. Of course, there are the tours and concerts at the major venues, but it is hard to find the kind of small shows we like in the first two weeks of the year. We were planning on going to the Jason Graae/Faith Prince concert at the Rubicon Theatre (FB) in Ventura, but the tickets were expensive and they weren’t showing up on Goldstar. But then I started to see announcements of the monthly cabaret at one of the theatres at which we subscribe: Chromolume Theatre (FB). This cabaret, which is “pay what you can” (meaning the show is free, and you make a donation), is a way of showcasing artists they like in an informal setting. As Chromolume started to list their artists — quite a few of whom were were familiar with from past shows of theirs — the show grew more and more interesting (and trudging out to Ventura seemed less and less interesting). So last night we went down to Chromolume, which is basically at the edge of Culver City and the West Adams district of LA, to see our first Chromolume Cabaret. The BLUF (bottom line up front) is that this is something we’ll do again, although likely not every month given our schedule. It helped build the connection to this theatre as family, something that has been missing since Rep East Playhouse (REP) in Newhall went dark. In fact, I’d encourage those folks who were active at REP to consider exploring this cabaret and venue: it has the same family feel of “just good” people. “A Quiet Thing” is a harder number given its range, and Claire did a reasonable job with it. She was stronger with her second number, “Don’t Rain on My Parade”. Both songs brought back memories of seeing the shows: Flora was done back in 1990 by the Pasadena Playhouse, and Funny Girl was done in 2016 by a guest company at the Colony in Burbank. I really enjoyed both Jason’s singing and performance in “Michael”, and that’s on top of the already enjoyable Joe Iconis song. Be More Chill is a show that really needs to be done in LA; the music is great. “Soliloquy” was an interesting choice — Jason was right that it is not a role he’s likely to be cast in … which is too bad, because he nailed the song and its emotion. I had not heard “Women” before, and I truly liked the song for its words and emotion. I need to get that cast album (alas, the cheapest I can find it is around $40 on Amazon, as it is out of print). So Tal wins the first “Stump the Daniel” award by having a show song I don’t recognize. She did a great job with it, as well as with “Other Side of the Tracks” (which also made me realize that Little Me is another show that needs a Los Angeles revival). On “Beautiful City”, the lyrics seemed somehow different, so I wonder if a different version is being licensed from what was in the show (well, at least it didn’t fit my memory of what was in the show soundtrack or cast albums). He did a nice job with it, nevertheless. Although I did see Carrie in the recent immersive La Mirada production, I didn’t recall the “Dreamer” song. The two numbers are very different: one is frenetic and full of energy, which Bonnie captured quite well. The other is more reflective, dealing with moving on after a tragedy. She did great with both of them. As noted, I hadn’t heard the first song before, but that’s not really a surprise as I rarely listen to modern pop music. Interesting song. I enjoyed the second — it is nice to see songs from the recent Amalie getting a new life after the show closed in New York. Amalie was a show that I really enjoyed at the Ahmanson, and I hoped would succeed on Broadway. Both songs were well performed, and the couple was cute together. Daniel Yokomizo (FB) accompanied the performers on the piano (Jaq and Gina added their friend Isaac on Guitar and Ukulele). Lauren J. Peters (FB) was in the booth. As noted at the top, Chromolume Theatre (FB) does these Cabarets monthly, so watch their Facebook page and their website for the announcement of the next show. I’m not sure we’ll make February, but do plan on attending some more. I also encourage you to subscribe to Chromolume: for $60 you get their three mainstage shows (Dessa Rose, Jane Eyre – The Musical, and Stephen Sondheim’s Passion), plus whatever they end up doing at the Hollywood Fringe Festival in June. We discovered Chromolume Theatre (FB) when we went to go see Prez, a solo show written by playwright Willard Manus about the Jazz musician Lester Young, who was played in this one-many show by Leslie Jones (FB). The production of Prez is being remounted with Leslie at Write Act Repertory (FB) in celebration of Black History Month as part of a Festival Series at Write Act Rep’s Brickhouse Theatre called THREE BY WILL IN REP. The Series includes two World Premiere’s along with the return of Prez. The intimate drama is produced by John Lant II, and will be directed by Daniel E. Keough. The show is set to open February 4th, 2018. All performances for Prez will be on Sunday at 2PM, through March 11th, 2018. Additional information is available at http://www.writeactrep.org/index.html. Christmas Movie: The Greatest Showman. I was remiss in not writing up the movie we saw on Christmas Day: The Greatest Showman. In short: we truly enjoyed it — both the music and the performances. I had seen some criticism that the story wasn’t true to real life of P. T. Barnum, but then again, neither was Cy Coleman’s Barnum. Barnum himself would have enjoyed the humbug being sold and how it was presented. Unlike the musical, however, The Greatest Showman focused primarily on the American Museum period in Barnum’s life; the musical went beyond this into his ventures into politics, into building utopias, and the eventual creation of the circus and the merger with Bailey. There were also some aspects of the American Museum that were left out — I can understand (perhaps) leaving out Joyce Heth, given the increased sensitivity of the subject and the tone the movie was going for, but to leave out “This Way To The Egress” was a bit more questionable. 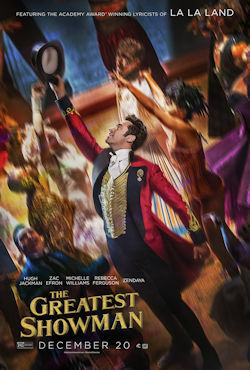 The two taken together, however, create an interesting picture; the movie demonstrates that perhaps it is time for a Broadway revival of Barnum. However, there are some odd timeline clashes between the two (particularly in the timing of the creation of the circus as distinct from the museum). Perhaps some of those issues could have been handled through a more detailed epilogue or disclaimer at the end — I’m not sure. I was particularly taken by the musical numbers and their accompanying cinematography and choreography: they had a movement and a rhythm that one cannot do on the stage, and it was engrossing. The song that was submitted to the Golden Globes — “This Is Me” — I could see being a wonderful empowerment anthem (and it goes very well with Coleman’s “My Body” in The Life). I enjoyed the singing of the leads — I’m more and more impressed with Hugh Jackman the more and more I see of his performances. Just a delightful show, and the Golden Globe won by Pasek and Paul for the music was well deserved. Next weekend brings our first touring show, Aladdin, at the Hollywood Pantages (FB). The next weekend currently has no theatre; instead, there is a So Cal Games Day and a Walking Tour of Jewish Boyle Heights. The last weekend of January brings The Pirates of Penzance at The Pasadena Playhouse (FB). April looks to be a busy month. It starts with Love Never Dies at the Hollywood Pantages (FB) [as an aside, there was just a great interview with Glen Slater, the lyricist of that show, on Broadway Bullet that is well worth listening to). The second weekend brings A Man for All Seasons” at Actors Co-op (FB). The third weekend brings The Hunchback of Notre Dame at 5 Star Theatricals (FB) (nee Cabrillo Music Theatre (FB)), as well as our annual visit to the Original Renaissance Faire. The last weekend of April sees us travelling for a show, as we drive up to San Jose to see friends as well as Adrift in Macao at The Tabard Theatre Company (FB). Currently, we’re booking all the way out in mid to late 2018! We may also be adding an Ahmanson Theatre (FB) subscription, given their recent announcements regarding the next season. This has been a busy busy week, what with meetings and loads of stuff to do in the evenings. One of those evening activities was an evening at the Hollywood Bowl (FB) where we were seeing Brian Setzer and his Orchestra. Originally, this was going to be a simple evening: I’d work from home during the day, we’d take the bus to the bowl, have a nice picnic, and rock away. The universe, however, had other plans. I was specifically requested to attend some off-campus meetings, meaning I was driving into work (and driving back to the valley) instead of working from home. I spilled something all over myself after lunch, meaning not only was I off-site, but I had to deal with wet pants and a meeting to attend. My cousin, who was now living with us, stepped wrong and sprained her ankle, meaning (a) my wife lost part of the day at the ER, and (b) we had to switch to handicapped seating at the last minute instead of walking up the hill. Just one of those cascade failure days. The cascade continued when I got home. We caught the 6:00pm bus instead of the 5:45pm, and it didn’t leave Chatsworth until 6:30p, meaning we got to the bowl around 7pm, and then it took another 45 minutes to get reseated (because someone decided to work out all of their season tickets in front of us in the handicapped line). Then increased security at the Bowl (they’ve added metal detection scanners, meaning emptying all your pockets) let to my setting off security, and my time frustration getting in as things kept getting closer and closer to the show with dinner shifting further and further away. We didn’t have a chance to pick up merch or a program, as the handicapped route to the seats bypasses all of that. The band was OK, but it didn’t make me want to go out and get their music. I was more into the big-band side of Setzer, not the pure rock. I will observe this was the first bowl concert I’ve been to that didn’t start with The Star Spangled Banner. The show started with the big band numbers and rock run through the big band, and ended with rockabilly. Overall, the music was great and the crowd was dancing in the aisles. For the most part, the Setzer part of the show made up for any shortfalls during the day. I’ll note that Setzer only introduced some of his backup band; in particular, he didn’t introduce all of the big band members, nor did he introduce the backup singers. Not having a program, I couldn’t grab their information from there either (in fact, there might not have been programs at all). Of course, coming back meant the handicapped route again — meaning we had to wait for the last bus back to the Park and Ride, which got us back around 11:30pm, and home around midnight, and to bed at 1am… and getting up at 430am for work. It also meant dealing with an iGen teen who seemingly had a face in the phone all the time. More on that in another post. Ob. Disclaimer: I am not a trained theatre (or music) critic; I am, however, a regular theatre and music audience member. I’ve been attending live theatre and concerts in Los Angeles since 1972; I’ve been writing up my thoughts on theatre (and the shows I see) since 2004. I do not have theatre training (I’m a computer security specialist), but have learned a lot about theatre over my many years of attending theatre and talking to talented professionals. I pay for all my tickets unless otherwise noted. I am not compensated by anyone for doing these writeups in any way, shape, or form. I currently subscribe at Cabrillo Music Theatre (FB) (well, make that 5 Stars Theatricals (FB)), the Hollywood Pantages (FB), Actors Co-op (FB), the Chromolume Theatre (FB) in the West Adams district, and a mini-subscription at the Valley Performing Arts Center (VPAC) (FB). Through my theatre attendance I have made friends with cast, crew, and producers, but I do strive to not let those relationships color my writing (with one exception: when writing up children’s production, I focus on the positive — one gains nothing except bad karma by raking a child over the coals). I believe in telling you about the shows I see to help you form your opinion; it is up to you to determine the weight you give my writeups. August theatre starts with The Curious Incident of the Dog in the Night at the Ahmanson Theatre (FB) on the weekend. We are also squeezing in On The Twentieth Century at the Pan-Andreas Theatre in Hollywood from Proof Doubt Closer (FB), as a friend is in the cast. The second weekend of August? What made sitting through The Bodyguard worth it: Hamilton at the Hollywood Pantages (FB). I’m still scheduling September, but so far we have The 39 Steps° at Actors Co-op (FB) and Pacific Overtures at Chromolume Theatre (FB) [although a little birdie … OK, Nance from Chromolume whom I saw at The Last Five Years, indicated the dates on that are shifting out to November]. There’s also the Men of TAS Golf Tournament, if any theatre company reading this wants to donate tickets to our silent auction (hint, hint). 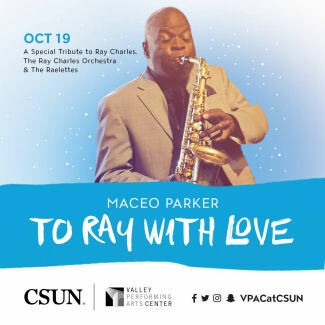 October is also filling up quickly, with Joseph and the Amazing Technicolor Dreamcoat at Cabrillo Music Theatre (FB), the Upright Citizens Brigade (UCB) at the Valley Performing Arts Center (FB), a tribute to Ray Charles — To Ray With Love — also at the Valley Performing Arts Center (FB), and Bright Star at the Ahmanson Theatre (FB). Lastly, looking into November, we have The Man Who Came to Dinner at Actors Co-op (FB), the Nottingham (FB) and Tumbleweed (FB) Festivals, a Day Out with Thomas at Orange Empire Railway Museum (FB), Spamilton at the Kirk Douglas Theatre (FB) and Something Rotten at the Ahmanson Theatre (FB). More as the schedule fleshes out, of course, but we’re booking all the way out in mid to late 2018 already!